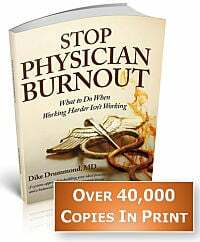 Physician Burnout is a constant, prevalent, looming threat over doctors everywhere. 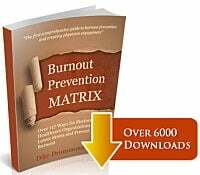 Our work with thousands of over stressed physicians We have isolated one of the major invisible causes of physician burnout – the pervasive mental conditioning of our training process. In this article I will show you four “flavors” of this conditioning – how and why they develop and how they contribute to our physician burnout epidemic. Some of the causes of physician burnout are hidden deeply in our subconscious -- beneath the surface of what would appear to be normal behaviors -- in a series of true blind spots in our awareness. The Conditioning of our Medical Education is one of these blind spots. Until you learn to recognize this brainwashing, it will drive your behavior and cause physician burnout in powerful ways. Let me show you your doctor conditioning. Yes, indeed, we are most certainly brainwashed by our medical education. There is a set of attitudes and behaviors that are expected of us while in training that become subconscious and automatic by the time we are board certified. These automatic behaviors set us up for physician burnout in private practice. Here are the four flavors I routinely see in my over stressed physician clients. NOTE: None of our instructors, professors or attendings has ever tried to “brainwash” you consciously and on purpose. The expectations and attitudes that create this subconscious programming are built into nearly every facet of our medical education as NORMAL and “the way things have always been done around here”. To most physicians in private practice the programming is invisible and unrecognized and the automatic behaviors it produces are dysfunctional and baffling. You will see in a second why this “brainwashing” virtually guarantees physician burnout in your 40’s and 50’s if it continues to sit in your blind spot. Here they are in all their glory … see if they feel familiar to you. These four behaviors are actually functional – even essential – when we use them to get through a rough night on call or a particularly onerous clinical rotation. However, they go much deeper than that in most doctors. The process of becoming a doctor is so extremely challenging to most of us that we cannot help but feel our survival is threatened from time to time. So these four behaviors/attitudes get driven into our mental programming as a Survival Mechanism. We learn them at a deep subconscious level and can’t turn them off. How deeply are we brainwashed? Basic training in the military is 8 weeks. In that time they can condition an 18 year old to take a bullet on command. Medical education is a minimum of 7 years. (how long did it take you from your first day in medical school to your first day in private practice?) I believe there is no more thorough conditioning program on the planet than becoming a doctor. – and that is the problem. Not everything in a doctor’s world is a nail … especially after you graduate to private practice and the rest of your life. Physician burnout results when these four become “overused strengths”. – when they are using this set of hammers to drive things that are NOT nails. => When your only response to a challenge or “problem” in your practice is to work harder — that is your workaholic programming. I can assure you there are other ways to address almost any practice issue that do NOT involve you personally working harder. => When you feel like every challenge for your patients, your staff, your family and yourself sits on your shoulders and you “should” be able to solve them all — that is your Superhero programming. You are human. You are not a god. Learn to say, “I don’t know the answer to that” or “I wish I could help here, I wonder what you will decide to do?” and let things go that are outside your control. Breathe. => When you when you constantly agonize over miniscule details and demand everything be perfect - and expect the same from everyone else - that is your Perfectionist programming. While perfection is a laudable goal in the clinical practice of medicine, when this tendency generalizes to the non-clinical aspects of your practice and - even worse - your home life and relationships with your family, it can drive everyone crazy. The wasted energy demanding the impossible goal of universal perfection is a huge drain. => When you micromanage, can’t let things go and drive you and everyone around you crazy by having to do everything yourself — that is just your Lone Ranger programming. Yes, you are ultimately responsible for the outcomes in your practice (and your life) and you CAN ask for support. You can delegate and create systems that will take away some of your burden while delivering the quality you demand. It is possible. For most of us these four horsemen and their automatic behaviors are deeply subconscious. 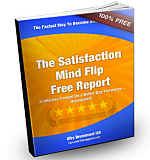 Remember that you spent a minimum of 7 years installing them in your psyche – deliberately, consciously, through thousands of hours of dedicated study and on the job training. No wonder they poke there heads into all areas of your life – and not always in a good way. AND this is not the only risk factor for physician burnout. The stressful, draining nature of the clinical practice of medicine. We have a tough job to begin with. Lots of responsibility and very little control. If clinical medicine was the only thing we had to worry about, physician burnout levels would be higher than a “normal” person — turns out it is only one of the big four. All the other demands placed on us in private practice that have nothing to do with clinical medicine. Documentation/EMR, billing, the business of medicine, compensation formulas, practice politics, political uncertainty, our leadership roles we are unprepared for — and many other non-clinical hassles. The care and feeding of our larger life outside of medicine. Getting our own physical and emotional needs met, our significant other and family relationships, our personal finances – everything outside of our career. We put this off throughout our training and now our ability to avoid physician burnout hinges on creating this work-life balance. And last, but certainly not least, our subconscious programming/brainwashing and the four horsemen I have laid out here. Their automatic behavior often throws gas on the fires created by stressors 1-3. A recipe for physician burnout. Here’s a simple way to expose your own brainwashing and lower your physician burnout risk. 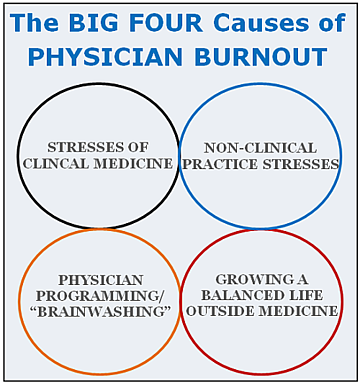 PLEASE LEAVE A COMMENT below and tell me how you have noticed physician burnout and these four horsemen in your life.